Anyway, despite their feelings about the subject, I still try my best to keep them engaged and excited about our math lessons. 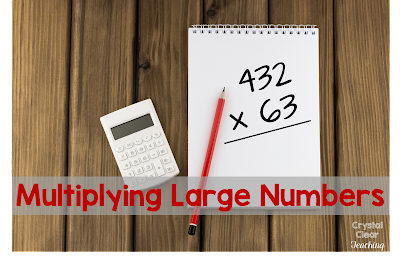 If you have students who are like mine, you may be looking for some ways to keep your students' attention during the painstaking process of practicing multiplication problems. Here are 3 easy ways to keep them participating (and maybe even having fun!). 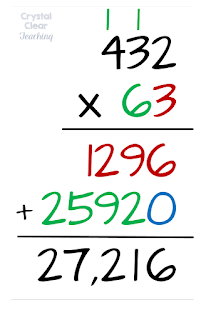 In a large multiplication problem, you are essentially repeating the same process for each digit in the second number. In the example pictured above, you multiply the 432 times the 3 in the ones place. Then you multiply 432 times the 6 in the tens place. For many of my more visual learners, examples like this give them a concrete visual of the connection between the ones place quotient and the tens place quotient. Each new place would get a new color. I also will often let my students use colored pencils to copy this strategy when they are solving problems on their own as well. You can also grab a FREE set of color coded multiplication examples by clicking on any of the pictures below. These examples fit inside the folded envelope and are perfect for an interactive notebook. You could also have your students keep the envelope and examples at their desks for reference if you don't do interactive notebooks. Now I should explain that I am a strict "no calculators" teacher. I firmly believe that my 5th and 6th graders need to understand how to solve math problems on their own before they are allowed to use calculators in middle school and high school. So when I tell my students that I am going to let them use calculators, they tend to get pretty excited. The catch is that I don't let them use a calculator to actually solve the math problem. Instead, I pair up my students. Each student then solves a multiplication problem either on paper or on a small white board. Then the students trade papers (or boards) and use the calculators to check their partner's multiplication problem. The checker can simply mark the problem wrong. However, if you want to make the exercise more challenging, ask the student who checked the problem to figure out any errors in the work. This adds another level of problem solving to the exercise. To make this even easier for you, I would use a set of multiplication task cards to assign the problems. Just hand each pair of student two task cards and let them solve and check. When everyone has finished with their first problems, have the pairs rotate to the next desk for a new set of task cards. Colored dice can make any math concept a little more fun, and multiplication is no exception. Give each student 3 or 4 dice of one color and 2 or 3 dice in another color. 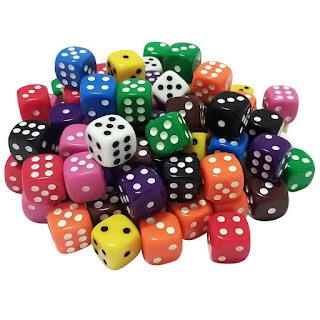 (If you don't have enough dice, you could have pairs or trios of students take turns using the same dice, but Amazon has sets of 100 dice for less than $20.) Each student would then roll all the dice in their hand. They would use one color to make the first number and the other color to make the second number. 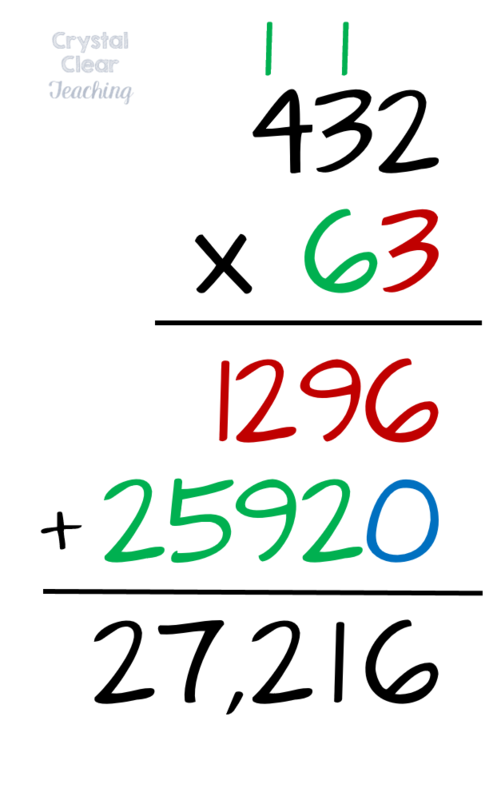 Then the student would multiply the two numbers together. The second student then rolls the dice again to get two new numbers to multiply. The student with the largest number wins that round. You can decide how many rounds your students will play depending on how long your math class is and how much practice you feel your students need. At the end of the game, the student who has one the most rounds has won the game. I like to play this game in pairs to keep the students more engaged all at once. The smaller your game groups, the more often each student is getting a chance to multiply. 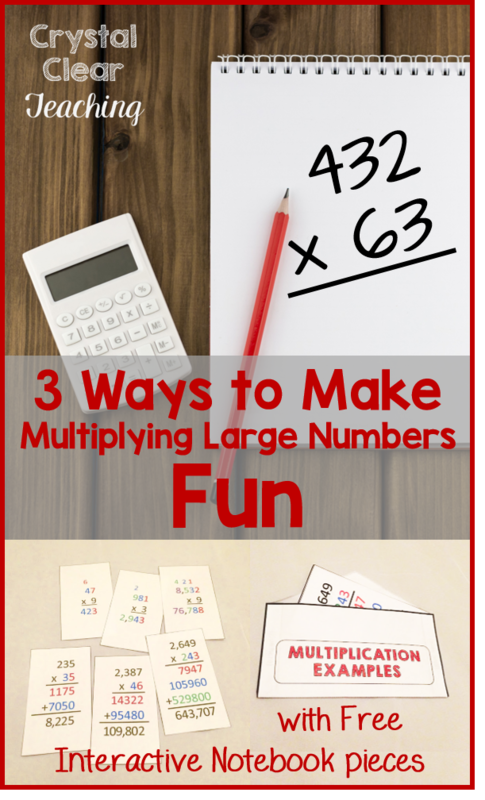 These are just a few ways to spice up your multiplication teaching and practice. 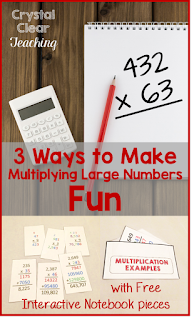 Do you have other fun ideas for practicing multiplication? I would love to hear about them in the comments below! I've decided this year to start a new series on my blog. I think we would all agree that reading is a crucial skill for our upper elementary students. 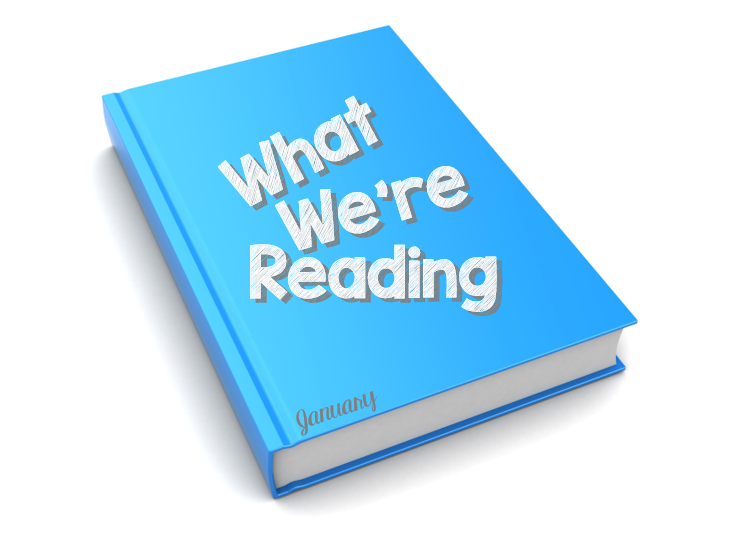 We want them to read fluently, understand what they are reading, and enjoy the books they read as well. That means the goal is to fill our classrooms with books that our students will love. Hopefully, this series will give you some ideas of books that you can put in your own classrooms. 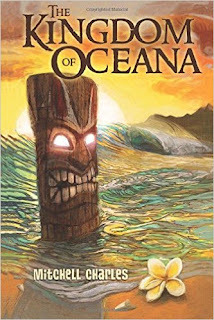 This summer, I read the book Kingdom of Oceana by Mitchell Charles. The very first page starts with two brothers headed home after a day long adventure. Suddenly the older brother attempts to kill the younger brother by jumping over a huge waterfall! I was hooked. Add in a little magic, a beautiful princess, and a horrific curse threatening the entire island and you have a spell-binding story. Of course, in true teacher fashion, I read the book while thinking of how I could use it in my classroom. Here are just a few of the ways this book would be easy to include in your lesson plans. 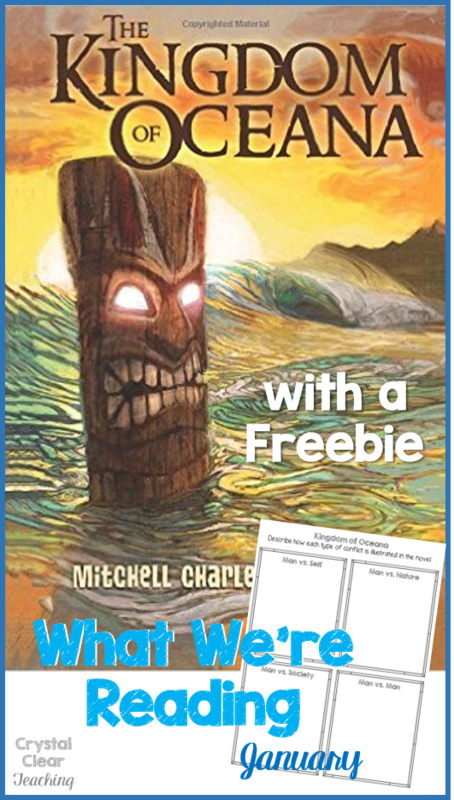 Kingdom of Oceana is full of fun and interesting words that your students may not be familiar with. Words like "capsize" and "aghast". Even better, most of these words are surrounded by sentences that make the meaning clear. You could make a list of words your students might not know and have them figure our the meaning based on the context in the book. This would be a great exercise to use especially after teaching context clues. Kingdom of Oceana would be a perfect novel to use during a unit on conflict. The book includes each of the types of conflict I discuss in my unit. Internal conflict - Man vs. Self: the main character, Prince Ailani, struggles with the knowledge that he may one day be king. He has to overcome his feelings of inadequacy to accept his place. External conflict - Man vs. Nature: The kingdom is set on a Hawaiian island so the boys encounter several dangerous animals. 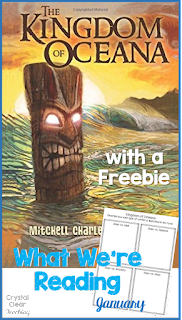 At one point, Ailani even has to save his brother from a great white shark! External conflict - Man vs. Society: On a rival island, the leaders are burning whale oil which goes against everything Ailani has been taught as right. Revealing this secret ruins a plan for peace between the two islands. External conflict - Man vs. Man: Probably the main conflict in the novel is the animosity between Ailani and his brother, Nahoa. The two boys are constantly arguing and fighting. Ultimately, Nahoa wants to be king instead of Ailani. To help you review conflict, feel free to download, print, and use this free graphic organizer with your class. Just click on the picture to download. 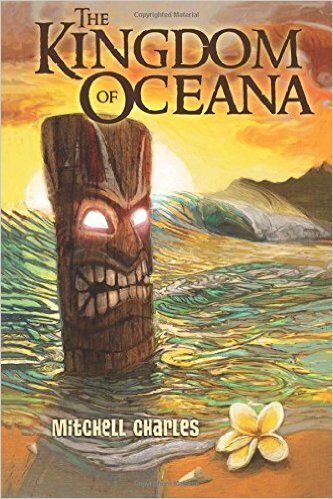 You can pick up your own copy of Kingdom of Oceana from Amazon by clicking on the title above. I can't wait to share the novel with my class, and I'm sure yours will love it too! Ok, so I'm not into New Year's resolutions. I've tried the whole "New year, new me" stuff. It doesn't work for me. Those resolutions tend to last a whopping week, at most. So the past couple of years, I have been setting goals instead. After all, isn't it much better to have something you're working towards instead of just making random life changes. This year, I want to spend some time during this week (our first week back from Christmas Break) showing my students how to set their own personal goals for the year. Upper elementary students, as a rule, don't know how to set good goals. 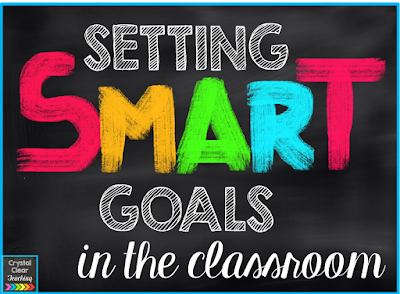 Teaching students about setting SMART goals is a skill that they will use in the future. So what is a SMART goal? SMART is an acronym that stands for Specific, Measurable, Actionable, Realistic, and Time-bound. In other words, a SMART goal should be something that a student is capable of accomplishing within a certain amount of time. And yes, I realize that it can be hard to get students to understand this type of goal setting. So in the next section, I have listed some great free (or at least super cheap) TpT products to help you and your students have success in goal setting. If you want a great Free product to help you teach this to your students, this SMART goal setting lesson is perfect. Just download, print, and you're ready for your lesson. It includes posters and worksheets for your students to fill in as they set goals. not only walks students through how to make a SMART goal, but it also has them list 3 steps they can do to reach that goal. At only $0.75, this SMART goals classroom guidance lesson is definitely the best deal. It includes a lesson plan, posters, handouts, and a powerpoint too! It seems to be designed for guidance counselors, but I think it could be used in a classroom as well. I hope this is the start of a great second half of the year for you! Crystal Clear Teaching is a participant in the Amazon Services LLC Associates Program, an affiliate advertising program designed to provide a means for sites to earn advertising fees by advertising and linking to Amazon.com.